If the discussion is about real estate boom then one cannot let go mentioning Dholera of course. 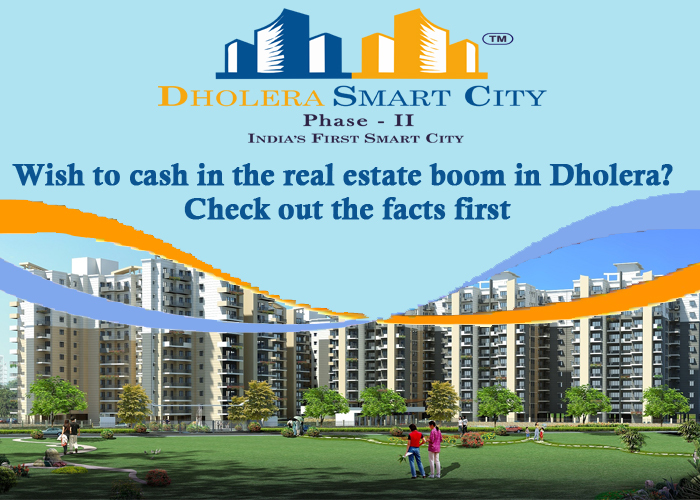 The first smart city to be developed in India, Dholera is not just the largest Greenfield Project of India but also the fastest growing one. And when we say fast, we mean it! Dholera is one of the rare cities that seems to be developing faster than we Indians could have ever imagined. Every now and then some new activity in the city is making it to the headlines. Funds are being sanctioned, land is being allotted or an airport is being approved - all adding on to the real estate boom that the city has already entered. If you are one amongst the many thousands who are keenly observing Dholera real estate markets and desirous of cashing in the realty boom here, please read on. Rs. 5400 crore (appx) has been allocated towards its development which means that the city shall grow at a rapid pace. Being close to the DMIC and DFC makes it a definite hub for economic opportunities. More than 8 lakh new employment opportunities shall be created in the region by 2040. Dholera international airport further accelerates its development and shall significantly add on to foreign fund inflow in the city. It shall seamlessly connect Dholera to the world thus making it globally popular. The city shall use ICT and have state of art infrastructure and world class amenities. Spread over 920 Sq. Kms. the authorities have carefully divided the land in 6 town planning schemes and phased out its development in three phases. The basic infrastructure shall be set up by 2019 as per Aecom. Analyze the price and amenities being offered for similar plots and only purchase one after reviewing all available options. If you are buying the plot to live in, consider the transit means from the area. Safety first- Please ensure that the plot is located in safe area. Disclaimer :- SmartHomes, Dholera Smart City, Smart Dholera and Invest in Dholera Smart City are the trading names and brands of SmartHomes infrastructure Pvt. Ltd. which is a proposed subsidiary of Smart Infrastructure PTE. Ltd. based in Singapore. We do not trade under any other brand name neither are we associated with any other trading style, brands or company in any manner what so ever. Our policies are unique to SmartHomes Infrastructure Pvt. Ltd. and all the 4 trading names are owned by SmartHomes Infrastructure Pvt. Ltd. The brands SmartHomes, Dholera Smart City, Smart Dholera and Invest in Dholera Smart City are the trademarks and trading names of SmartHomes Infrastructure Pvt. Ltd. Kindly note that we only do the financial transactions in our company name that is SmartHomes Infrastructure Pvt. Ltd. www.smart-homes.in, www.dholera-smart-city.com, www.smartdholera.com and www.investindholerasmartcity.com are the intellectual properties of SmartHomes Infrastructure Pvt. Ltd.